^ Bruce J. Borque, Twelve Thousand Years: American Indians in Maine (Lincoln: University of Nebraska Press, 2002), 16; Emerson W. Baker, “Finding the Almouchiquois: Native American Families, Territories, and Land Sales in Southern Maine,” Ethnohistory 51, no. 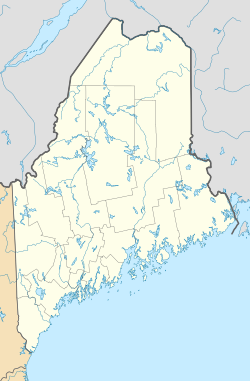 1 (Winter 2004): 73-100; Christopher Levett, A Voyage into New England: Begun in 1623, and Ended in 1624 (London: 1628); David L. Ghere, "The 'Disappearance of the Abenaki in Western Maine: Political Organization and Ethnocentric Assumptions," American Indian Quarterly 17, no. 2 (Spring 1993): 193-207. ^ Coolidge, Austin J.; John B. Mansfield (1859). A History and Description of New England. Boston, Massachusetts. pp. 123–124. http://books.google.com/books?id=OcoMAAAAYAAJ&lpg=PA9&dq=coolidge%20mansfield%20history%20description%20new%20england%201859&pg=PA123#v=onepage&q&f=false. Joseph Conforti, "Creating Portland: History and Place in Northern New England;" Lebanon, New Hampshire 2005, 9-12. ^ Emerson W. Baker, “Formerly Machegonne, Dartmouth, York, Stogummor, Casco, and Falmouth: Portland as a Contested Frontier in the Seventeenth Century,” in Creating Portland: History and Place in Northern New England, ed. Joseph A. Conforti (Lebanon, NH, 2005), 1-19. ^ Emerson W. Baker, “Formerly Machegonne, Dartmouth, York, Stogummor, Casco, and Falmouth: Portland as a Contested Frontier in the Seventeenth Century,” in Creating Portland: History and Place in Northern New England, ed. Joseph A. Conforti (Lebanon, NH, 2005), 1-19; see also Colin G. Calloway, ed., Dawnland Encounters: Indians and Europeans in Northern New England, (Hanover, NH: University Press of New England, 1991). ^ W.M. Willis, Journals of the Rev. Thomas Smith and the Rev. Samuel Deane(Portland: 1849),54, 59-60; http://falmouthcongregationalchurch.org/history/; Charlotte Donald Wallace, E Pluribus Unum: a Story of Falmouth, Maine (Falmouth, ME: Falmouth Historical Society, 1976), 19. ^ Spignesi, Stephen J. (2003). The Essential Stephen King. Franklin Lakes, New Jersey. p. 214. http://books.google.com/books?id=134fGRDDangC&pg=PA214&lpg=PA214&dq='Salem's+Lot+Falmouth.